Finally:A small, discreet plastic magnet, which - despite its small size - is stronger than many large magnets. The Boston Xtra Mini can hold 12 A4 sheets or a thick piece of cardboard. 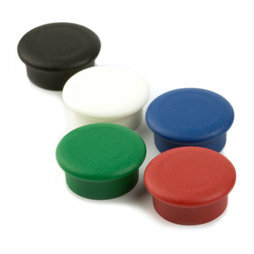 Thanks to the ergonomic cap made of light-resistant plastic, it is easy to remove - despite its enormous adhesive force. The little muscle man is available in an economic set of ten and in five different colours at an attractive price. The Boston Xtra Mini is the little brother of Boston Xtra. Both are equally strong because they both use the same disc magnet 10 x 5 mm. The large Boston Xtra is easier to grasp, but the mini version uses less space and is cheaper. The Boston Xtra Mini is available in white, black, red, blue and green. A set contains 10 magnets of the same colour. In addition, we offer an assorted set with 2 magnets of every colour. Winner on all fronts: The Boston Xtra Mini! The Boston Xtra Mini is not only much stronger and prettier than standard whiteboard magnets, it also lasts much longer because it is made of high-quality, light-resistant and durable ABS plastic. The Boston Xtra Mini is so strong, you can even use it on magnetic paint. Standard ferrite magnets are too weak for a wall with magnetic paint. The problem with many magnetic glass boards is that standard magnets rarely stick to them because the glass is too thick. Strong disc magnets can be a solution, but handling them is sometimes problematic because they attract each other so strongly that it is hard to separate them. The Boston Xtra Mini solves this problem because it is strong and easy to handle. On direct contact with metal, the adhesive force of the Boston Xtra Mini is naturally the highest. Despite its small size, it can hold 12 sheets of paper or a thick piece of cardboard with no problem. It holds a single A4 sheet so tightly, not even a strong wind could blow it off. With its minimum adhesive force of 1,5 kg you have to work hard to get it off the metal. The Boston Xtra Mini is therefore multiple times stronger than a standard ferrite magnet. The secret of its high adhesive force: In each Boston Xtra Mini hides a strong disc magnet 10 x 5 mm. Clever: The magnet is set back by 0,1 mm. It doesn't touch the surface, therefore, damages and scratches on the magnet's coating are impossible. This air gap is also the reason why it can't reach the full adhesive force of 2,4 kg of the S-10-05-N. But a higher adhesive force would not make much sense anyway. The Boston Xtra Mini comes in a set of 10 in a white stackable box. Choose from five colours or an assorted set with two magnets of each colour. The plastic cap is manufactured in Austria exclusively for supermagnete. The injection of the magnets is done in a sheltered workshop in Switzerland. With a Boston Xtra Mini you receive a product that fulfils the highest quality demands.